If you’re like me you love that last of the summer holiday’s….Labor Day. It’s time to break out the BBQ, the steaks, hotdogs, whatever you desire. It’s that fun in the sun moment when you realize that winter is just a few short months from being in full bloom. Labor Day, oddly, is that last day off in the summer sun. From our family to yours...all the best. But what is it really? I went out on the net for some research and here is what the other sites had to say….. In the late 1880’s, labor organizations began to lobby various state legislatures for recognition of Labor Day as an official state holiday. The first states to declare it a state holiday in, 1887, were Oregon, Colorado, New York, Massachusetts, and New Jersey. 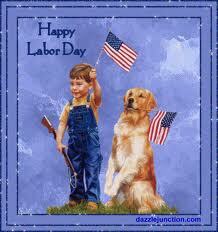 Then in 1894, Congress passed a law recognizing Labor Day as an official national holiday. So whatever your country, life or disposition, happy Labor Day.